"This quick and easy dip for fruit was given to me by my aunt many years ago. It is a hit whenever I serve it." 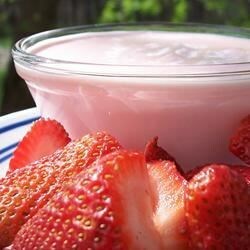 In a bowl, stir together yogurt, mayonnaise, sour cream, sugar, and grenadine; mix well. Cover and refrigerate 2 hours to overnight to allow flavors to meld. The mayonaisse made it not taste very goos - but before I added that it was quite tastey. Yummy! Cheap to make, kids love it. Don't go buying that garbage that they sell in plastic tubs at the produce aisle. Make this just the way you like it. Tastes fine with lite ingredients too.